Buzz Words: Guess Who Says Moo? 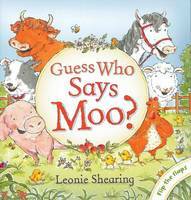 Guess Who Says Moo? is a lift-the-flap book filled with farmyard riddles. It is squarely aimed at the market for parents reading to their child from 12 months and beyond. These young children will get caught up in the guessing game and eventually want to open up the flap by themselves to see if they are correct. Each opening follows a simple pattern. On the left there is the text with an illustration of the animal’s job and the page is surrounded by a faint border of their footprints. On the right page of the opening is an edge-to-edge scene filled with farm life and a fully-integrated half page flap hiding most of the mystery animal. All illustrations are in black ink highlighted with pencil and watercolours in cheerful spring colours. The text also follows a pattern and gives several clues to the animal in hiding. It describes one feature of the animal and tells us the noise the animal makes. It shares the animal’s job and poses the question “Who am I?” On the opposite page we read “I am the…” and must lift the flap to confirm our guess. Typical farm animals are featured including a hen, dog, horse, cow, sheep and pig. In the end, they all come together to make the farm. This book has a few layers and there is certainly plenty to discover and discuss in the illustrations for each opening. Guess Who Says Moo? could easily become a childhood favourite. The large font, common sight words, and predictive text could also make it a fun book for emerging readers to read back to parents.